Alfred’s Essentials of Music Theory is designed for students of any age, whether listeners or performers, who want to have a better understanding of the language of music. In this all-in-one theory course, you will learn the essentials of music through concise lessons, practice your music reading and writing skills in the exercises, improve your listening skills with the available ear-training CDs (sold separately), and test your knowledge with a review that completes each unit. Computer software is also available with randomized drilling of the material and scorekeeping. 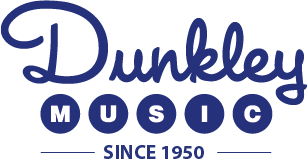 Book 1 (Lessons 1-25): Staff, Notes and Pitches * Treble & Bass Clefs * Grand Staff & Ledger Lines * Note Values * Measure, Bar Line and Double Bar * 2/4, 3/4 & 4/4 Time Signatures * Whole, Half & Quarter Notes/Rests * Dotted Half & Quarter Notes * Ties & Slurs * Repeat Sign, 1st & 2nd Endings * Eighth Notes & Rests * >Dynamic Signs, Tempo Marks & Articulation * D.C., D.S., Coda & Fine< * Flats, Sharps & Naturals * Whole & Half Step, Enharmonic Notes. 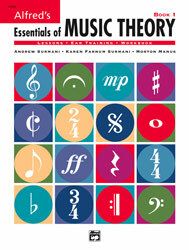 The complete line of Alfred’s Essentials of Music Theory includes Student Books, a Teacher’s Answer Key, Ear-Training CDs, Double Bingo games, Flash Cards, Reproducible Teacher’s Activity Kits, and interactive software for students and teachers in private study, studio and network environments.